Most people use a PC with monitor 23″ down, monitor size that comfortable with visibility on the desk. But for certain activities such as gaming or multimedia, it will be more convenient if you use a larger screen to gain better experience. For that, Chimei released 27VH series as a successor to 22VD and 24LH series which has been comes previously. These monitors are classified as V type which relies visual acuity (vivid) with contrast ratio of 10-million:1. Through Chimei Color Enhancement technology independently developed, Chimei trying to display beautiful impression through the rich coloring. Chimei also choose the color gradation system in 3D than 2D. The goal is to get more light and shadow display color naturally between gray background (dark-light). This is what makes impressions delivered Chimei panel to look different. Connectivity provided are complete. On the rear panel there is hidden ports for HDMI, DVI and D-sub. This hidden location is little troublesome to install cables especially when the monitor is attached to the wall. One something quite unfortunately is this monitor does not have a DisplayPort connection. 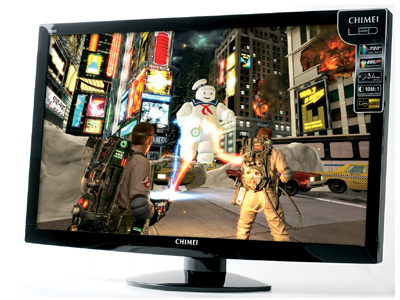 Chimei 27VH more ideal for running gaming activities or watching HD movies. Support connections also quite complete though without a DisplayPort. Another interesting thing lies in price which fairly competitive for monitors 27″ on its class.